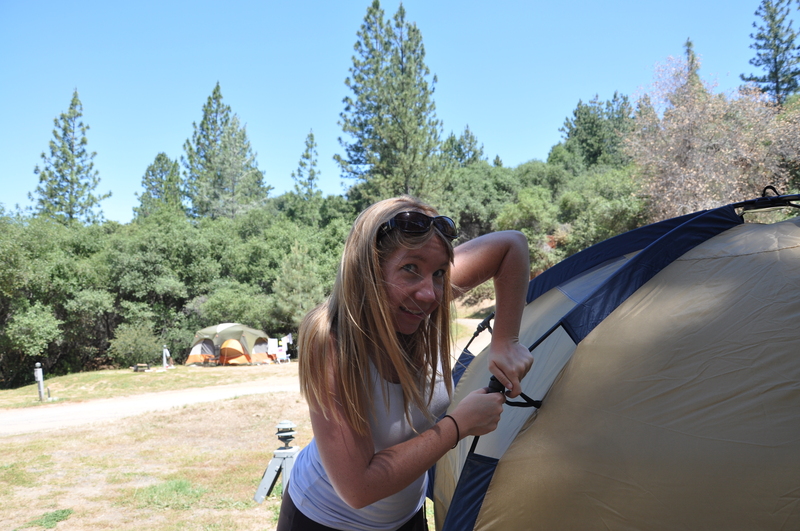 My mom and I are not big campers. Our cumulative knowledge regarding pitching tents, starting fires and warding off bears is on the same level as my Chinese language skills. Very low. So when we threw my uncle’s tent in my car and headed up to Yosemite National Park we made sure to reserve the least-outdoorsy campsite we could find. Enter Yosemite Pines RV and Camping Resort. They have WiFi. And a pool. While this type of “camping,” may make some people shudder (like my brother, who will head up a mountain with a nothing but a blanket and a hunk of cheese of a few days), I highly recommend it for camping novices such as myself. If you run out of ice, the general store is a short walk away. If you don’t feel like eating over a fire pit, there’s a cute little town with numerous restaurants nearby. If you can’t get your tent up, there are dozens of families surrounding you that’ll probably help you out. Not like we needed help with that. Our tent turned out to be of the pop-up variety. Thank God. “Assemble in 90 seconds,” my mom read. I looked dubiously at her. “I don’t think I can even get it out of the box in 90 seconds,” she scoffed, setting her watch on the picnic table so we could time ourselves. We didn’t do to bad. Twelve minutes later we had ourselves a tent. We didn’t bother setting up the ‘room’ divider or putting the rain cover over it, so that time is slightly skewed. 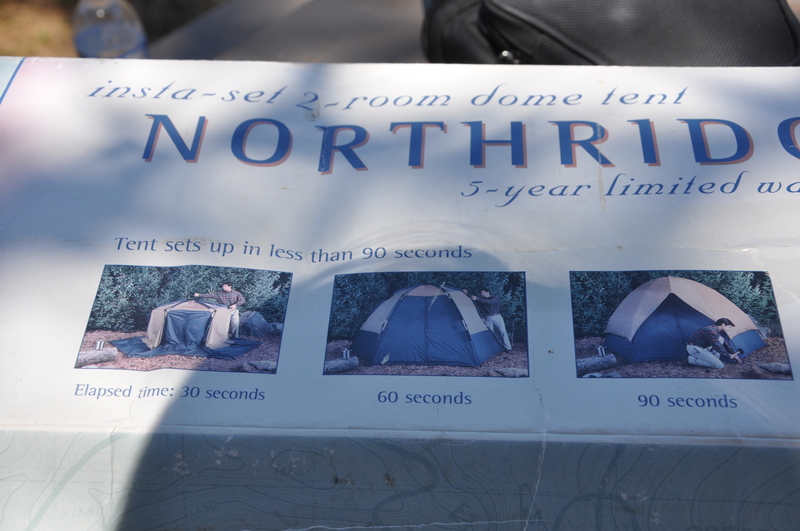 Tent problems solved, we headed off to Yosemite National Park. Our “campsite” was 22 miles away from Yosemite’s west entrance, but it took us about an hour to get to Yosemite Valley, where all the action is. We’d been looking forward to renting inner tubes and floating down the river, but that was a no go. Just like every other river in America, Yosemite’s Merced River was way too full to be sending rafters downstream. When we were there in the middle of June it was eleven feet above flood levels. Chances are there will be no rafting at all this summer. 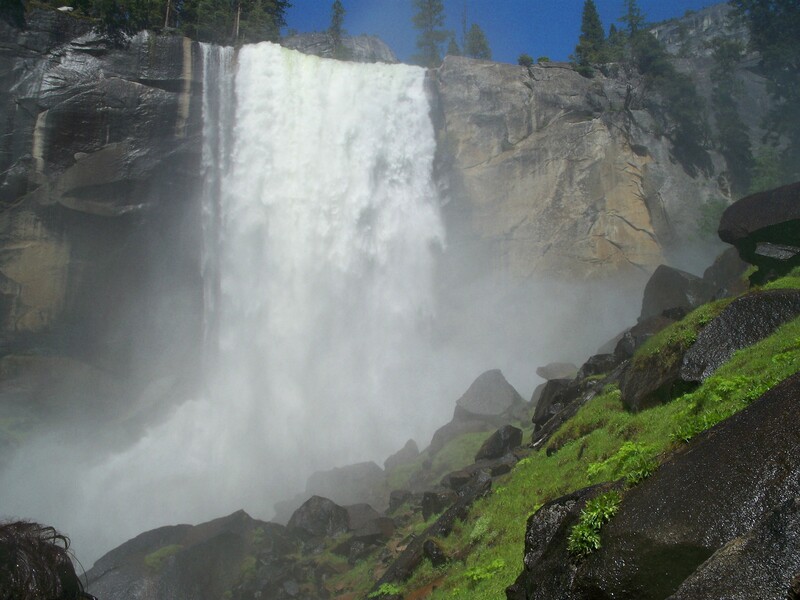 So we went hiking instead, up the Mist Trail to Vernal Falls. It’s a steep hike, but only a couple of miles. The National Park Service recommends that you allow yourself 2-4 hours to complete this hike, but my mom and I did it in just over an hour. 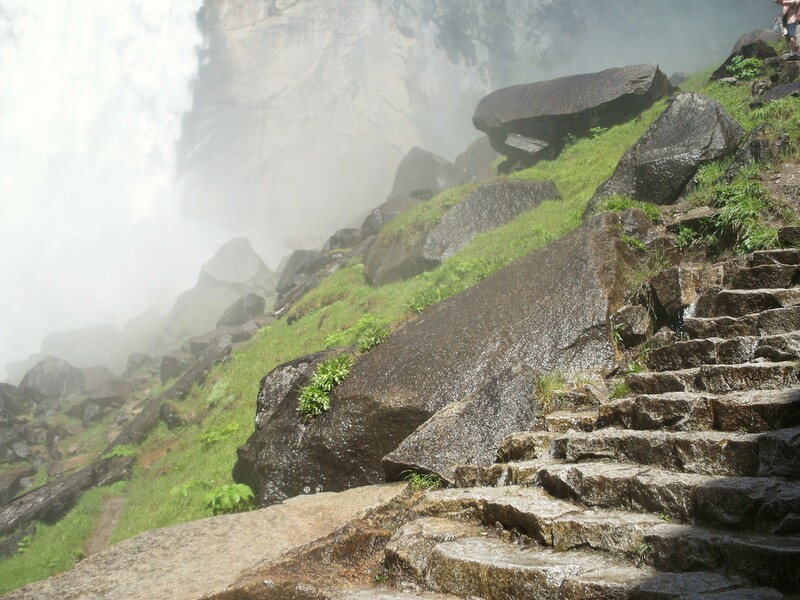 Prepare to get very wet if you go all the way to the top of the falls, as the mist feels more like rainfall. After our hike we rented bicycles and explored Curry Village and Yosemite Valley. Bikes are definitely the way to go here. 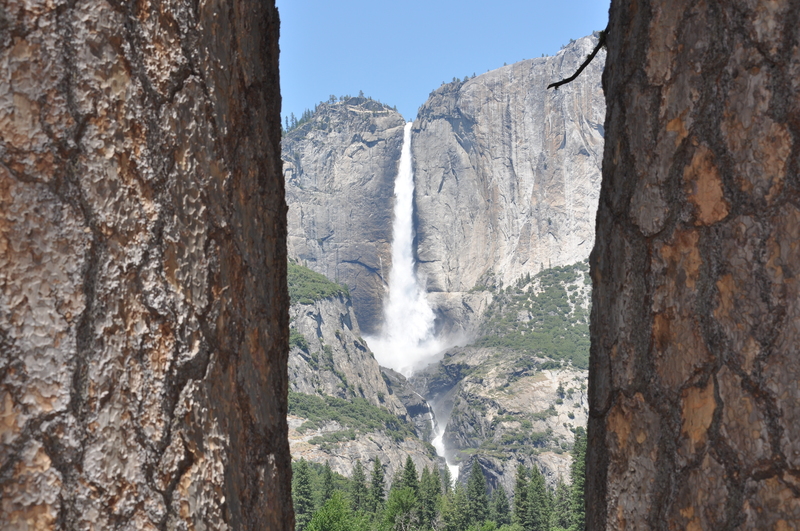 Yosemite Valley is VERY crowded. Trying to navigate the shuttle system or find parking will quickly sour your national park experience. Bikes can be rented for $10 an hour ($5 more if you want a helmet) at shuttle stop 13a under the green tent. After picnicking, hiking, and biking through Yosemite, we joined the long line of cars leaving the park and headed back towards our campsite…which we passed by, opting instead to go out to dinner in Groveland. After an Italian meal and a couple glasses of wine we returned to Yosemite Pines, settled into our tent and fell asleep to Johnny Cash tunes that our neighbors were playing at the next site over. Ah, nature. 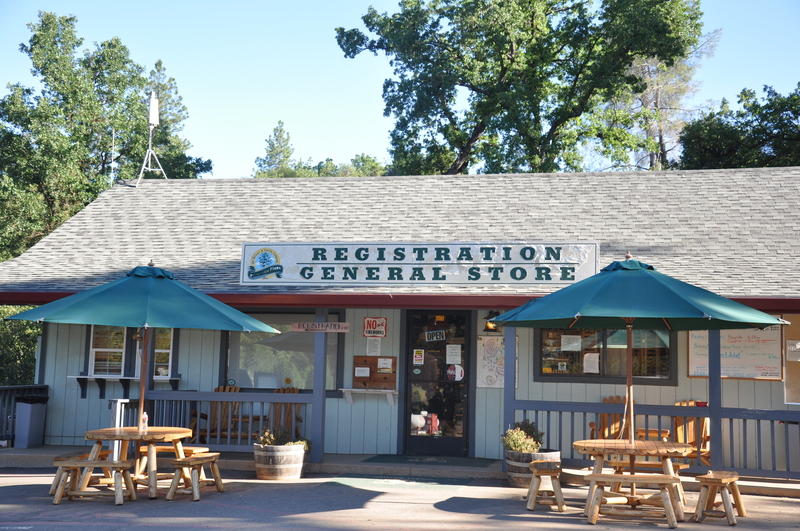 If you also want to just barely camp, Yosemite Pines RV Resort is at 20450 Old Highway 120, Groveland CA, 95321. Call ahead for reservations at 209-962-7690. We reserved a day in advance, but it was a weekday. They were apparently booked by the time we arrived. Our campsite was $25, although prices are naturally higher for RV sites. Yosemite Pines also offers cabins and yurts for those who didn’t steal pop up tents from their uncle.